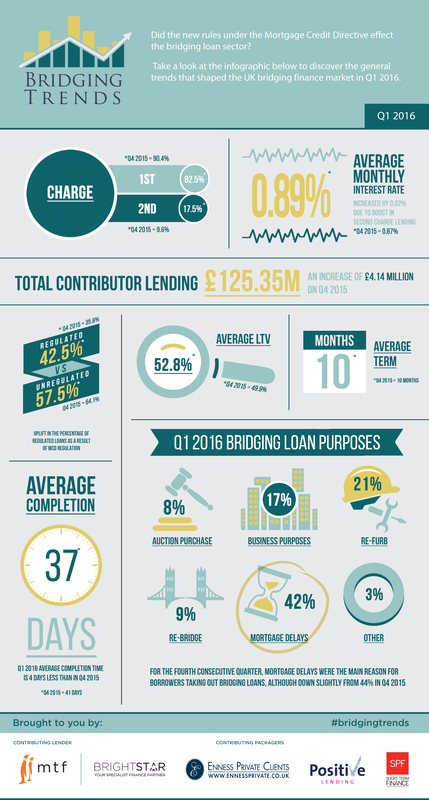 Take a look at the infographic below to see the trends that shaped the bridging finance market in Q1 2016. “Once again the biggest reason for someone taking out a bridging loan is because of delays with their long term mortgage. This is shocking and causes unnecessary costs for borrowers. It is always a surprise to me that a mainstream mortgage takes such a long time to complete given that so much of the process is now automated at so many lenders, whereas a bridging loan which is underwritten individually on a case by case basis can be completed in under forty days. “Steady as she goes is probably quite healthy for lenders and borrowers alike, but not great for news headlines. “However, I think the focus on the Brexit vote has now intensified so it will be interesting to see what impact that has on the next set of data. Market sentiment is mixed on the impact it will have, not in terms of the outcome itself, but more to do with the uncertainty the vote brings.